From “Edifying Fables for Altmeri Children”, by Kelkemmelian. Published in Alinor, 4E 28. Once upon a time, there were three Mer. Although the gods had departed the world and Aldmeris had fallen, they looked to the future with hope. For the Missing One had been defeated and now the children of the et’Ada could wander the earth unopposed. “I will travel to the great forest”, the youngest said. “I’ve heard that it’s full of beauty, and a paradise for hunters”. “I will travel to the ashlands”, the middle one said. “I’ve heard that they’re the promised land where people can grow strong and proud”. “I will stay here”, the eldest said. “I’ve heard that the Missing One still lurks, and someone has to protect our home”. The youngest settled in lush Valenwood. Soon, he discovered that it wasn’t as beautiful as the western isles, and working the land was difficult and unforgiving. Because he had always been the laziest, he convinced himself that the gods didn’t want him to embrace agriculture, and from that day on he would only eat what he could hunt. He became the first Bosmer. The middle one settled in barren Morrowind, where everything is ash. There was so much ash that it got into his lungs, and his eyes, and his blood, until his very skin turned ashen gray. He thought he had been fooled, but instead of admitting his mistake, he convinced himself that the gods had abandoned him and turned to the demons instead. He became the first Dunmer. The eldest one stayed in the blessed Alinor, where the land is gentle and caring. But instead of resting on his laurels, he worked tirelessly to build architectural wonders and to discover the secrets of magic. He created enchanted weapons and glass armor, and always kept watch, for he knew that the Missing One would strike sooner or later. And thus he became the first Altmer. Of course, the eldest one was right. He was Altmer, after all. At the top of the highest mountain, far from unfriendly eyes, the Missing One still plotted the destruction of Auri-El’s heirs. From filthy mud, he made a mockery of an elf, filled its innards with poisonous weed and had a frost spirit breathe life into it. He called the creature “Man” and ordered it to bring Sithis to the world. When the Man arrived to Valenwood, it had already devoured the Mer from the North and the Mer from the Heartland. Despite this, the youngest one thought he could reason with it or, in the worst case scenario, hunt it down like any other beast. But the Man had inherited some of the Missing God’s devious mind, and burned the Bosmer’s wooden house. The youngest one, fearing for his life, ran to the ashlands to ask his sibling for help. The Dunmer mocked the Bosmer and blamed his defeat on his naiveté and weakness. “I’m not like you”, he said. “If this Man comes to my house, my dark gods will give me the power I need to vanquish him”. But when the Man arrived, the Dunmer discovered that the demons didn’t answer his prayers. And because his house was made of ash, the Man only needed a shout to bring it down. “Do you see what happens when you ignore the warnings of our ancestors? This is the Missing God’s work, no doubt, and it will be our end if we don’t stop it before it’s too late”. His siblings wept, recognized that they had been foolish and pig-headed, and begged the Altmer to help them. Their plight moved him, and he promised that he would take them under his wings as long as they respected the ways of the ancestors. He armed himself and waited for the monster. This time, the Man was puzzled. Brutish as it was, it didn’t know how to attack a fortified position. It punched the walls, with little effect, and kept doing it until the metal doors opened and the Altmer faced him with his enchanted weapons. The Man uttered animalistic growls that resembled words, trying to scare its opponent, but the Altmer stood fast. With one single blow he tore its heart and killed it. He knew that the Missing One would try again, but for now his home was safe. 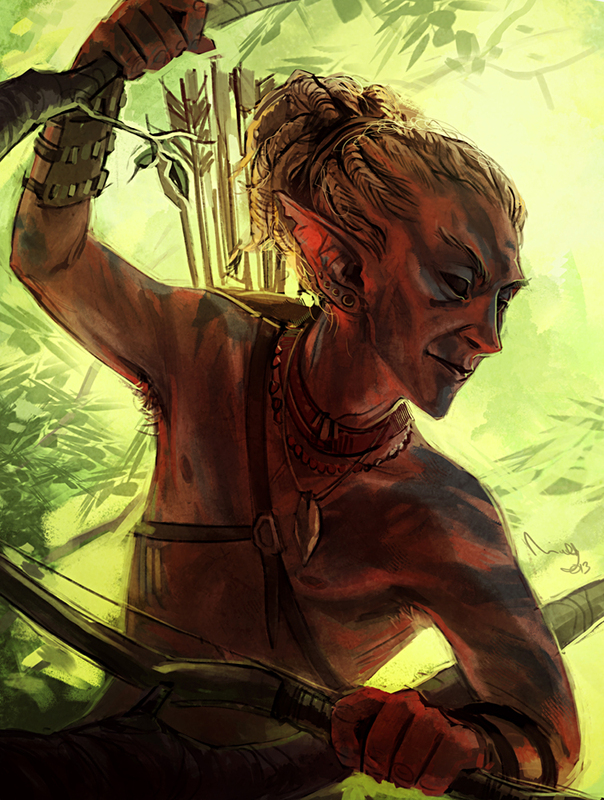 “You’re without a doubt the best of us!”, the Bosmer claimed. “Truly, the only one worthy of being called Auri-El’s heir”. “I see now that my beliefs were wrong”, the Dunmer said. “The power of the gods is with you and with you alone”. The Altmer accepted their honest praise and invited them to a victory feast. As for the remains of the Man, the Bosmer ate them when he thought no one was looking. Such a thing was boorish and uncouth, but everyone agreed that, all in all, it was a fitting end for the creature. And there was much rejoicing. This article was first published to the TESlore subreddit and appeared in Volume 1, Issue 7.